The Estonian Ott Tänak took a dominant victory at 38th Rally Argentina, the fifth round of the 2018 World Rally Championship. It’s his first win of the season and the third WRC victory in a career. The previous two he scored last year with Ford, today he finally wins for the first time in a Toyota Yaris WRC. Tänak moved to the lead after the fifth stage on Friday morning. Until the end of the day, he built up an advantage of 22 seconds over Kris Meeke. On Saturday, Tänak ended a day with 46.5 sec advantage ahead of Thierry Neuville. On Sunday, the Estonian was just controlling a gap to finish the rally with 37.7 sec advantage. Thierry Neuville and Dani Sordo secured a double podium for Hyundai. Neuville was also the fastest on the Power Stage, earning additional five points. Sebastien Ogier (Ford) and Andreas Mikkelsen (Hyundai) were fighting for P4 until the last stage. Ogier was the second-fastest on the Power Stage, taking four additional points and finishing fourth overall while Mikkelsen finished in the fifth place. Elfyn Evans (Ford) finished in the sixth place, ahead of Kris Meeke (Citroen). The Irishman was in a podium fight until the last Saturday’s stage when he picked up a puncture and had to change a wheel. 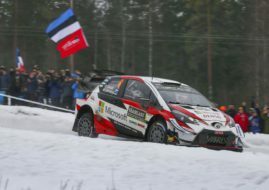 Esapekka Lappi (Toyota) and Teemu Suninen (Ford) finished in P8 and P9 respectively, ahead of the best WRC2 driver Pontus Tidemand in a Škoda Fabia R5. The first four drivers from Rally Argentina are also on the top of the championship classification after five rounds: Ogier (100 points), Neuville (89), Tanak (72) and Mikkelsen (52). Hyundai extended the lead among manufacturers. The next WRC event is the Rally Portugal on May 17-20.